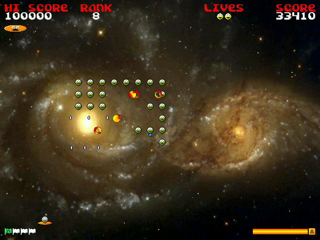 Attack of The Smilies is a fast paced version of the age old classic game of Space Invaders. Where this game is different is that instead of shooting green aliens you are attacking smilies that start as grinning and menacing invaders, but soon change their expression as their attack wave is destroyed. As well as power-ups that upgrade your fire power, you can also collect a shield to protect you from the attacking minion. Attack of The Smilies is simple, fun and totally addictive. It's the ideal game for the whole family to enjoy.